The Samsung GT-I9300 Galaxy S III benchmarks were hosted for a while on GLBenchmark, left there by a careless tester. Thankfully, a tipster took a screenshot before they were taken down, and sent it to us. With the power of deduction we concluded last week that the only possible scenario for a chipset in the Galaxy S III is the officially unannounced quad-core Exynos 4412 clocked at 1.4GHz, which apparently comes with an ARM Mali-400 GPU, but clocked at 400MHz, making it 50% faster than the current edition in the Galaxy S II. Since we know that some of you were worried about the graphics performance with "just" a 50% boost, instead of the sexier sounding "5x the performance" of Mali T-604 that is in the Exynos 5 series for tablets, we compared the screenshot that was tipped to us with the other heavy hitters. Not all test components are filled with the non-final unit, but what's there paints quite the rosy picture. Clocked at 400MHz+ in the next Galaxy line leader, Mali-400 delivers 50% superior performance in comparison with the GPU in the Galaxy S II, which would very well make the Galaxy S III the fastest smartphone on the market when its final version hits shelves. 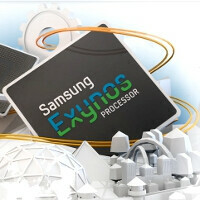 The current best in Android benchmarks is destined to step aside and make way for the Galaxy S III with Exynos 4412. Both are made with the 28/32nm die shrink. The smartphone graphics champion gets beat by a small margin in most test elements by a prototype GT-I9300 Galaxy S III, thanks to the overclocked version of Mali-400. Both Tegra 3 in the One X and Mali-400 in the Galaxy S III have to power HD displays, but the 40nm die of the mobile GeForce graphics processor is showing its age compared to the 32nm Exynos. A mighty quad-core PoweVR was used by Apple to supply the rendering chops for the high-resolution screen on the new iPad, which naturally beats everyone else in benchmarks, but Mali-400 in the Samsung GT-I9300 prototype holds its own very well against it too, only giving ground in some of the benchmark components. As you can see, the results from what is likely still a prototype Galaxy S III unit, beat the current Android king Snapdragon S4, beat Tegra 3 by a large margin, take over the iPhone 4S by a tad in most GPU test components, and even hold their own against the mighty quad-core PowerVR graphics in the new iPad. Since we already heard rumors about "superlative" benchmarks from the new Exynos, we are inclined to believe the same will be true for the CPU as well. Long story short, until we see some benchmarks from the Adreno 320 GPU in the next Snapdragon, or if the next iPhone uses the same PowerVR as the new iPad (which wouldn't make much sense), the Samsung Galaxy S III could very well rule them all in its finalized version. Therefore worries that the phone doesn't have the Cortex-A15 based Exynos 5 series inside, which has actually been developed by Samsung to power high-resolution tablets, are apparently premature. omg. makes me wanna sell myself or my kidney just like the chinese iFan or myself just to buy this stuff. the words used in these article is giving me goosebumpss hahahaha i think im so attached. ok calm down boy. No, we're excited because it's ACTUALLY FAST. You, the iSheep, get excited because it has a new dual core 800 MHz processor!! Wow! Oh, and it has the new iCloud. This means that you can sync apps and music and stuff over the Cloud, just like Android! Only after 5GB, you have to pay money!! All I'm saying is, it's okay to be a sheep when your shepherd is the Terminator. You wish u had these specs on ur outdated nokia windows but u cant poor u. wait another 2 years. IDIOT! ARE YOU INSANE? DONT YOU KNOW ABOUT HEALTH! wooooo.... its gonna be a monster and hopefully worth the wait & hype. It makes me go crazy whatever may be the next galaxySIII looks one thing we all must admit that we all enjoy these rumours. I had also taken some screen-shots when they were in the GLbenchmark database. Check for yourself -- http://farm6.staticflickr.com/5200/7058354569_4e81d0b61b_c.jpg http://i42.tinypic.com/zqvdu.jpg (this is already posted in the article) Also in Beyond3D forum, a member found in a kernel dump that Samsung has revved-up the frequency to 440MHz in the Mali400. Results show that it's more powerful than tegra3 and SGX543MP2 in iPhone4S. http://forum.beyond3d.com/showpost.php?p=1634670&postcount=316 For comparison, SGS2 had Mali400 running at 266MHz. Something iPhoneArena forgets to mention is that the SGS3 is pushing 1280x720 pixels, while the SGS2 is pushing only 800x480 and the iPhone 4S only 960x640 To put it into clearer terms: SGS3 ==> 921,600 pixels iP4S ==> 614,400 pixels SGS2 ==> 384,000 pixels The SGS3 is faster than anything out there, has a 320dpi screen that is a whopping 4.6" huge and still thinner and lighter than the brickPhone! Take my money already! Mirror my sentiments brother... Shut up & take my money. no, ur wrong. Glbenchmark.com shows SGH-I9500 as taizen based Samsung smartphone being tested. results are already up for it on that site., and it showed SGH-i9300 as Galaxy S3 before being removed. you do realize that the LG Star is the LG G2X right? Galaxy S3 performance wise is looking very tasty. I just hope Samsung do it justice by designing a premium looking device made of premium materials and not a generic plastic box. Come on Samsung you can do it! i like the plastic cause it keeps it super light! A phone can feel premium while still feeling light, for example Nokia and HTC use polycarbonate casing which feels solid yet is light. Samsung have the know how to produce similar things, or they can utilise ceramic materials as rumours indicate. Either way for a flagship product I think it's important for it to stand apart from mid and low tier Samsung phones. It needs to shine alone!! I only trust 4 benchmark tests: Antutu, GL Benchmark, Browser Mark and SunSpider. not s**tty Quadrant and Linpack. Exynos 4412: The return of the King! I must admit that I prefer Quadrant to Antutu, as the second one puts too much stress in the CPU performance. But that is just a personal preference. But at the very minimum you should add Nenamark to your list of trustees! Nenamark is good, but it depends on the resolution and as a result, people are likely to have the mistake when seeing the benchmark. GL Benchmark is perfect for not only on tab/phone but also on PC. Quadrant is easy to be adjusted, so it's untruthful. In my opinition, taking into account the resolution is the right thing to do. Nenamark at the end measures the final performance of the device and the user experince when using it, not merely the GPU performance. Of course I admit that to compare GPUs GL Benchmark is better, but to compare devices Nenamark is OK too. quadrant is one of the most easily faked tests there are.. same with linpack. if you do like to use quadrant, then you need to buy the pro version and take out the whole I/O section (i believe its the first big blue section off the top of my head) before you compare and contrast. Linpack is an I/O test as well. Both are useless and quite easily fluffed. Antutu is great. Pair it with nenamark2 and you have CPU and GPU tests. Smartbench 2012 is also a good one.